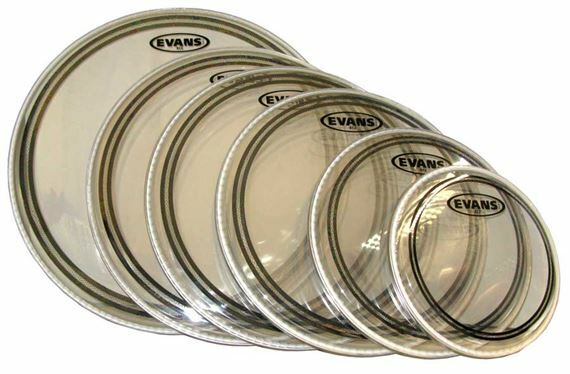 Shop Evans EC2 Edge Control Drum Heads from AMS and enjoy Fast & Free Shipping. Evans clear EC2 series features two plies of 7mil film with optimized attack, tone, length of sustain and ease of tuning for each size head. The Sound Shaping Technology (SST) Edge Control ring mounted on the underside delivers an extremely well balanced and pre-EQ'd sound across the full kit by varying the size of the ring for each different head size. Evans Level 360 technology is incorporated to extend the level playing surface of the drumhead, 360 degrees around the drum. The vertically enhanced collar design guarantees even contact with the critical bearing edge of the drum shell, resulting in: ease of tuning, extended pitch range and optimum quality of sound. Evans Level 360 technology resolves the age-old dilemma of traditional synthetic heads consistently not fitting the drum shell without using considerable force. Evans coated EC2 series features two plies of 7mil film with optimized attack, tone, length of sustain and ease of tuning for each size head. The Sound Shaping Technology (SST) Edge Control ring mounted on the underside delivers an extremely well balanced and pre-EQ'd sound across the full kit by varying the size of the ring for each different head size. Evans Level 360 technology is incorporated to extend the level playing surface of the drumhead, 360 degrees around the drum. The vertically enhanced collar design guarantees even contact with the critical bearing edge of the drum shell, resulting in: ease of tuning, extended pitch range and optimum quality of sound. Evans Level 360 technology resolves the age-old dilemma of traditional synthetic heads consistently not fitting the drum shell without using considerable force. These are excellent heads, sound great with very little overtones. Super easy tuning. Best heads for toms. In love with these heads! I love the clean look and the sound is amazing! Highly recommended! Great sound. Easy to Tune. Absolutely worth the $. This coming from a guy who was a die hard fan of Aquarian heads. Still a fan, but these have become my go to for Toms. These tune super easy. I’ve had them over a year, and they sound fat! love the sound of these heads, the best head sound i have ever heard!!! I love the tight sound of an Evans head.